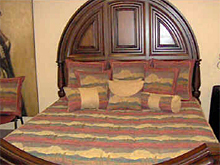 Custom Made Bedspreads for Adjustable, Split-Top Adjustable, Round and Standard Beds. Numerous Solid and Designer Print Fabrics available. Six Quilting Patterns to choose from! A Bedspread is a bed cover that drops all the way to the floor on three sides of the bed, and has a 19" pillow-tuck at the head. Various fill weights can further customize the appearance and weight of your Bedspread. Custom Made Comforters for Standard, Round, RV,Adjustable or odd size beds. Numerous Solid and Designer Print Fabrics available. Four Quilting Patterns to choose from! A Comforter does not have a pillow tuck and drops over the sides of the bed a few inches below the top of your box spring. Various fill weights can further customize the appearance and weight of your Comforter. Quilt Pattern - Four to choose from! We carefully select, sort and clean our down to assure the highest quality and longest lasting fluffiness. Our patented, ComfortLock® three-sided border design keeps down from shifting to the edges and bottom of the comforter by locking the down on top, where you need it most. Our comforters are warranted to be allergy free. Dust, dirt and allergens have been removed so all our down is Hyperclean®. We use the most leak proof fabrics. They are sewn with 100% cotton fabrics, woven tighter and specially finished to help prevent down from escaping. For those who prefer fiber filled products, we offer the Ultima Supreme™ or the Ingeo down alternative comforters. Specifically created to mimic the loft and warmth of down, this comforter is filled with highly slickened Ultima Supreme™ fiber coils that offer silky loft and breathability adding to your year round comfort. A Duvet Cover is a cover for your comforter, designed to be decorative during the day, and removed at night when the comforter is in use. All of our duvet covers have a Zippered closure. When placing your order, please be prepared to give your exact comforter dimensions, since there is really no such thing as a "standard queen-sized comforter." The dimensions provided in the table below are provided to give you a rough idea of where your comforter fits in, as far as pricing.